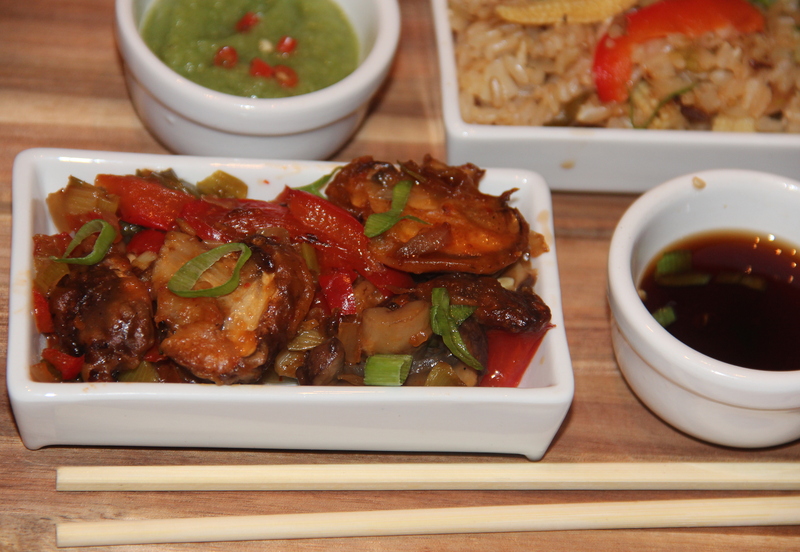 Steamed brown rice is stir fried with babycorn, bell peppers, cabbage, onions along with oriental sauces. 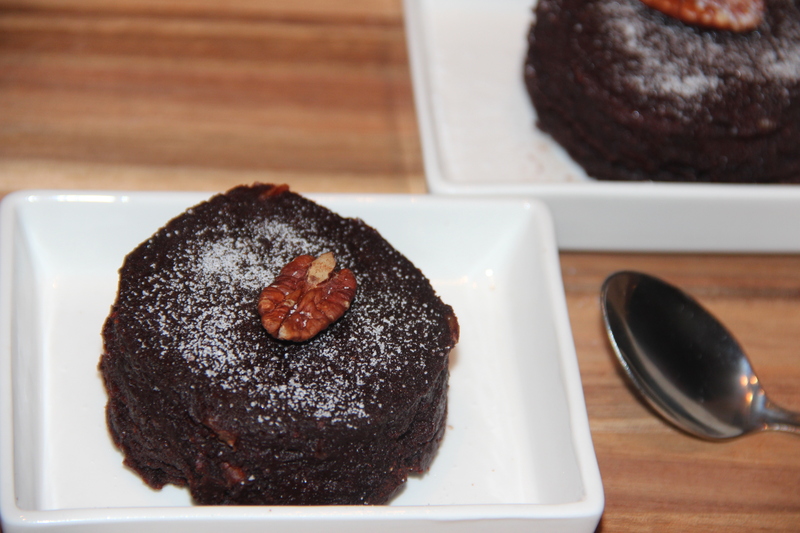 Healthy low calorie and low fat eating doesn’t mean compromise on taste. Exploring different ways to season and cook, you can enjoy healthier foods. While many people enjoy eating Chinese dishes, they often think that it is difficult to fix these dishes at home. Try this low-calorie version of fried rice, and see for yourself just how easy it is. Heat oil in a wok/large frying pan; Add chopped garlic, onion and saute for a minute. Then add bell peppers/capsicum and baby corn saute for 3-5 minutes. Add in cabbage, chilli sauce, vinegar, soy sauce, salt stir fry for another 3-4 minutes. Stir in rice, spring onion greens, ground black pepper mix well and allow to heat through for 1-2 minutes. This can be served as main dish for 3 course chinese meal. Left over rice can be used or cooked ahead and chilling gives grainy texture. Green chilli sauce is optional, for mild spice just ground black pepper will do. 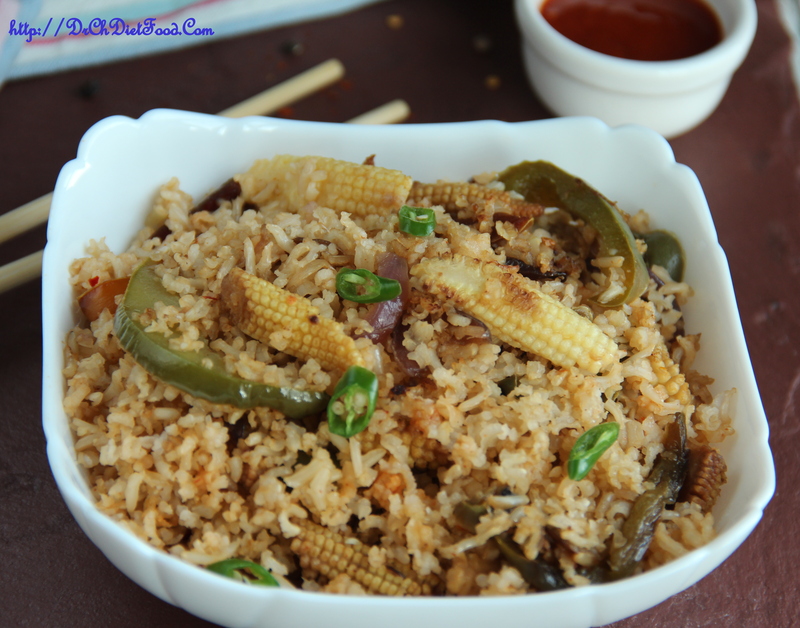 Posted on June 8, 2015, in Indian, International, Main Course, Main dish and tagged baby corn rice, bell pepper baby corn healthy main dish, capsicum fried rice, info- chinese fried rice, simple main dish. Bookmark the permalink. 40 Comments. I love fried rice and this fusion recipe is wonderful. Fusion food is the best. This is so delicious! wow! I love how I can always count on you for healthy inspiration! Thatz really sweet of you Sarah, I feel sooo encouraged with such encouraging feedback. … am blessed… thanx a million bunch…. I love different foods served with different sauces…It makes the meal so much more interesting! Low fat and so flavourful! Thank you for sharing!! !